Carol Sternberger earned her undergraduate degree in nursing from Purdue Fort Wayne. In 1988, she earned a M.S. in Nursing from Ball State and in1998, was awarded a PhD in Instructional Design and Educational Computing from Purdue West Lafayette. 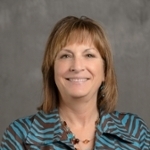 Dr. Sternberger began her academic career at Purdue as an Assistant Professor of Nursing in 1990 and advanced to Professor and Chair of Nursing. For the past six years she is the Associate Vice Chancellor for Academic Programs and is the Director of Graduate Studies at Purdue Fort Wayne.